The Black Angel of Iowa City – WHAT DID YOU LOOK UP ON WIKIPEDIA? 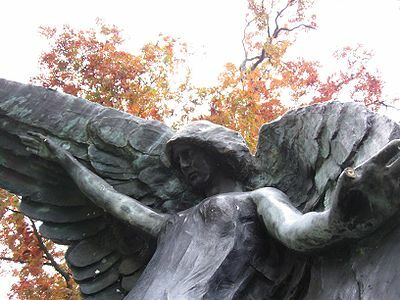 Today I’m leaving Iowa City but before I do, I thought I’d post on one of the local legends, The Black Angel, a sculpture located in Oakland Cemetery. According to Wikipedia, The Black Angel was erected in 1913 and was commissioned by Teresa Feldevert, a Czechoslovakian immigrant for both her son, who died at the age of 18 and her husband Nicholas, who died only a few years after their marriage. When Teresa died in 1924, her ashes were also buried there. Though her birthdate is engraved on the statue, the death date remains empty to this day. The angel is black because of oxidation, though local lore has many other theories which include infidelity and murder. And while many angel statues have their heads looking up to heaven, this one looks down at the earth…or hell. There’s an urban legend that says if you kiss the black angel and you’re not a virgin, you’ll die. Many a mischievous bunch of teens or tourists’ lips have touched the bronze statue. So is the curse true? You’ll just have to come to Iowa City and find out for yourself.